I find that, in spite of my own sage advice to myself, I am working on a first person novel again. John Gardner, in The Art of Fiction, says “In any long fiction, Henry James remarked, use of the first person point of view is barbaric.” And yet, if this is the case, we don’t seem to lack for first person point of view novels, I’d venture far too many to count since the beginning of time. Is there something inherently apt for our technological times that lends itself to first person? One of the reasons I’ve avoided first person in a novel is that it always feels too limiting being locked into one character for several hundred pages. My inclination is to always want to go big, broad, reach for a larger perspective, something more readily done in omniscient or third person (the all knowing, all seeing and indifferent God paring his nails.) It’s interesting that in many reviews, point of view barely gets discussed, but it’s impact is fundamental, and inextricable--though saying this sounds ridiculously obvious. Nothing has more effect on character than its being written in first person. First person is character. I think the challenge for a novelist writing in first person--or one of them--is that unless you’ve got a compelling voice for this character, you are at a disadvantage. First person requires an extended performance. In a sense, the narrative never drops out of that register, and thus, it becomes difficult to reveal the other characters except from one specious point of view, which may (will be) biased, critical, and short sighted. The ancillary or secondary characters don’t get an equal hearing, unless your first person narrator can be entirely magnanimous. Or these characters have to become first person narrators, too. This is also a strategy, though I think the difficulty would then be how to distinguish one narrator from the next. But this doesn’t seem thematically what I want from a novel, though of course anything is possible. It’s an egalitarian point of view structure that favors one voice, which opens it up to being one-sided, lacking in complexity. Roth, to my brief survey, has evaded these problems using first person masterfully in Operation Shylock, and thus reveals why and how it is a viable point of view--challenging, but worth trying to pull off. Or at least trying to learn from Roth. 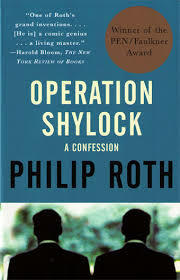 According to Claudia Roth Pierpont in her biography Roth Unbound, of the writing of Operation Shylock, Roth said: “I felt like I was dancing as a writer.” It shows. From the start this novel heightens complexity, not in the least by using a double, an imposter (supposedly) of the character Philip Roth. This forces Roth’s first person to challenge him by posturing himself as someone else in confronting the imposter, which reveals another way out of the first person dilemma, dialogue, which creates an immediate, unavoidable tension. This provides for brilliant conversation in which, apparently straightforwardly, the Roth imposter presents his views on Diasporism, to which character Roth can respond, incredulously, vehemently. This is wonderful, inventive satire. (And Roth makes it look easy; as well, he does this so beautifully that it is inspiring.) The doubling even extends to the character of John Demjanjuk--”So there he was--or wasn’t.” Even the possibility of uncertainty hangs over his identity as a Nazi camp guard. Roth expands a narrative with telling anecdote: it reveals, like good dialogue of which it is only one component--the subtext, and enriches the whole. Yet Roth achieves all of this without reverting, necessarily, to any outlandish “voice” or device. The language is relatively straightforward; his ability to bring the complexity to the fore makes it compelling. An aspect of Roth’s first person is that the narrator isn’t solely focused on himself; the first person point of view manages to invoke the personalities of the other characters through dialogue, and their behaviors, their descriptions, as well as when he or she makes pithy observations about them. It’s as if the first person narrator is putting himself in the background. The “I” never calls excessive attention to itself; in the dynamics of plot, the “I” never overshadows. Joshua Cohen in The Book of Numbers, utilizes a similar theme of the double while using the first person point of view. Cohen strains at this, at times. An extended reading is both necessary in order to get him--in essence, to learn how to read him--and to begin to get into the flow of the writing. His nerve, audacity, wordplay and storytelling is both exciting and infuriating, simultaneously. But then there is the question of length (the novel tops out at 580 pages); at some point, the reader has to come up for air. Cohen risks alienating a casual reader. There’s too many verbal tics, the use of onomatopoeia, the coinage of words and phrases. I might be an ideal reader for Cohen, but I’m in danger of feeling alienated. Nonetheless, Cohen is always an interesting writer, one of the most interesting young writers today. Roth is working within an invented satire. Though he is often addressing serious matters, he’s also going for comedy. It doesn’t always work. There’s often a drawn out quality--which is part of the satire, an over the top quality--in some of the scenes. These are relieved often enough by a shift in the scene, or a jump to another scene. I found some of the conversations with Aharon Appelfeld to be seminars in that writer’s work, and far more verbiage is spent on these encomiums than seems necessary or useful to the novel. In its exuberance, Roth’s novel is not exempt from criticism. It can be wordy and somewhat excessive; it’s not perfect. First person always forces the author to speak, by design, almost constantly. I’m reminded of ways of evasion, such as DeLillo does in Great Jones Street--a not wholly successful first person narrative. This evasion is one way of escape that a first person narrator can use to avoid the “I”; essentially, this is to talk about everything but oneself. In some way, this is also a strategy Roth uses, though in DeLillo’s novel, the gesture is far more deliberate and part of that character’s enigma. Perhaps because the story in Great Jones Street is about the mysterious actions of the protagonist--with nothing more than his anti-heroic thoughts and curious acts to inform us. Though I find writing first person initially limiting, I’m not convinced that it has to be. Roth, bears this out, exploring so many high absurd scenarios--and Cohen, too--though Roth relies on more variety of voices, through dialogue. I think the example does not have to limit the writing of first person to absurdity and humor strictly speaking; there’s as much opportunity to use these techniques in a more nuanced work. Still, there is somewhat of a temptation to go for the humor jugular, in a sardonic way, but the writer should beware of overkill. Perhaps we have moved into a time when the limitations that seemed intrinsic to first person point of view are rife for overturning. 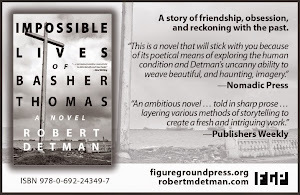 One challenge, to me, for 1st Person concerns other characters: the writer has to give the narrator's POV on them so that the reader sees them exactly as the narrator does—in a fairly proscribed way; but the WRITER also has to weigh in and somehow signal the reader that s/he recognizes the limits of the narrator's POV w/r/t these other characters, has to open them up, develop them within the confines of that aperture. It's a kind of irony, isn't it? Not dramatic irony precisely. To wit: the secondary character presents to the narrator in ways the narrator observes and remarks, but the reader grasps something perhaps deeper, fuller than maybe the narrator is capable of. Thanks for the comment--as usual, food for thought! I agree completely. I have been dealing with this issue with my current novel. The problem is made explicit when the first person character has any bias toward a secondary character (which is often unavoidable, particularly when the first person character has strong opinions). I have tried to mediate this by not implying anything beyond the narrator, in other words, no driving “god” type consciousness beyond the first person. This seems, to me, what a “pure” first person point of view should be, but maybe this is problematic; Roth seems to do this seemingly "pure" p.o.v. (pardon the use of quotes) and get away with it. The issue for my writing group is that I think they don’t particularly like my first person character.